I love the look of these! I will have to price them though. 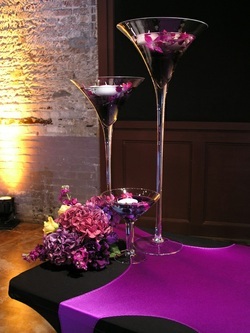 My other idea is just taking a variety of plain, clear vases and putting 3 on each table with floating candles. I'm debating whether or not to just do simple colored water or try submerged flowers. I've been wanting aqua - that's the one color that's stayed pretty consistent throughout the MANY times I've changed my mind! But this is the overall look I'm going for. 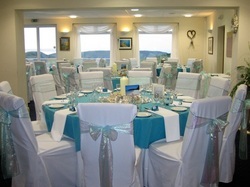 I love the bright blue and white together. It's so simple and tropical feeling. I'll put in hints of silver as well. I guess this kinda goes with decor. I love this card box! It would be a good way to incorporate engagement photos. It's basically 4 frames on a lazy susan. 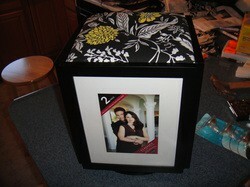 I got the idea from katieandshawnplanningbio.weebly.com.